Shabbat dinner at 6:30 p.m.
vices which begin at 8 p.m.
be an Oneg Shabbat in Dr.
call one of the synagogues. and two to three years of age. luncheon at which time Dr.
A world renown scholar, Dr.
A native of Philadelphia, Dr.
tion. It promises to be truly spectacular! clients at the Florida Mental Health Institute at USF. show of the Super Bowl at San Diego Jan. 31. Impressive! tle one was born November 22,1987 weighing 7 lbs. 11 ozs. and 20% inches long. This is JoAnn and Roy'a first child. Elyae Goldman, daughter of Susan and David Goldman. Marti Diaz. Aunt Judy Goldman lives in Sarasota. goals and at the same time help the State of Israel. ing ." and for Dr. Uzie! of the Tampa Bay Gratz College Representative. kids of the "Southern front,"
forward to a great semester!" _ 3431 SO. WESTSHORE BLVD. visit to Miami on Sept. 11.
ween the pope and Waldheim. shared his experiences with the women. services available at the home. lunch and an afternoon snack. 30-minute radius of the home. fee schedule will be developed. I! want more information about White River Camp. Bank (Judea and Samaria) worse? crush them, and the protesters can thus afford to be more daring. don't succeed in ending them quickly." So far, so good. request entry proceed at their own risk than to keep them out. tinued use of lethal force no matter how justifiable each case. tiff again will meet Austrian President Kurt Waldheim in June. American Jewish leaders with John Paul II in Miami. Waldheim visit as routine Vatican business are irresponsible. Pope John Paul II has made two serious errors on the same subject. with the Jewish Community in clear jeopardy. Latin America, according to a spokesperson. (divorce) in conjunction with a civil divorce." POSTMASTER: Send Address change, to The Jewish Floridian. aubecription ahouid notify The Jewiah Florida or The Federation. Minister Hans van den Broek. a "brother party" in Israel. of no such trial, the spokesperson added. be the main trouble spot. not putting any back in. Bruce Tannenbaum, son of Mr.
Rose Karpay of Hollywood, Fl. Mr. and Mrs. Theodore C.
Hovda, son of Dr. and Mrs.
Easy Chopped Herring. Gan Eden Chicken and Pears Concord. have a very happy and Kosher Passover! Mail coupon to: RECIPE GUIDE, P.O. BOX 484A. JERSEY CITY, N.J. 07303-0484. Request will not be processed without. and Mrs. H.K. Moore and Mr.
was hosted by Mr. and Mrs.
Dr. Richard Moore, and Mr.
Key West, Florida, and Mr.
of Philadelphia; Mr. and Mrs.
Estroff and Family, and Mr.
Finkel of Largo; Dr. and Mrs.
of Vero Beach; Mr. and Mrs.
Mr. Joseph Blum and Mrs.
New York; Mr. and Mrs.
soccer player for six years. Stuart Ian Mason, son of Ms.
Friday, January 22 at 8 p.m.
Friday evening, Dr. and Mrs.
President, at 286-8276, if they wish to assist. the dance performance of "Shalom '88." service delivery to Jews living abroad. lifeline in the U.S., Israel and in the Diaspora. portunity to make their 1988 pledge. mitment and responsibility to fellow Jews has not. continue to assume Jewish communal responsibility. Jews and to raise funds. give you insight into what the Federation stands for. munity raises and learn where the money is allocated. The 1988 campaign has set as its goal $1,370,000. take their responsibilities as Jews. component of the Jewish lifeline today! necessary social, educational and cultural function. who need our help. Also assist your fettw . is a gift for life! of 22 and 45 years old. ess Of The 1988 Campaign? that Jews have a quality community to be proud of. nant by making a meaningful commitment. not yet ready to dive into Federation roles. ed to consistently increase its membership each year. 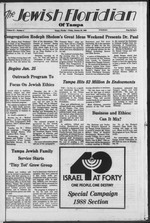 the Tampa Jewish Federation office (875-1618). communal life, as well as professional enhancement. g^\^-jM ^sfl M more than 85 neighbourhoods. TOM Programmes in Project Renewal neighbourhoods. farmland in a new Negev settlement. over an initial 14-month period. staff and supplies, to Youth Aliyah villages. couple at an absorption centre. justice, but it didn't happen,"
we will kick you out." I a strong fascist presence." Slogans such as "Bum Jews"
and "Jews To The Ovens"
school in Milan and on shops. Grape-Nuts Flakes is light and crispy. tight storage which keeps cereal fresh and crisp longer. essential vitamins and they're absolutely Kosher. So, for good taste and good nutrition. POST* is the natural choice. stitution, but to U.S. officials. force and to the use of terror." will use "whatever is needed"
M x<#w "Qur next party a real slmcha! na Ebstein of New York. or Write P.O. Box 2MS. Mrs. Lancz, Leighton Leib Prosck and Mrs. Josefsberg. faculty to take a personal interest in each student. others after the recent riots. public safety of the region." cepted meaning of the word. Mike Dukakis during his visit to the Jewish Towers. On Friday, Jan. 22, Rabbi H.
phet to Marry a Prostitute?" vices and deliver the sermon. evening 7 p.m.; Saturday morning 9:80 a.m.
13156-A North Dale Mabry. Rabbi Yoasie Dubrowski, Executive Director. 963-2817.
study discussion sessions, "Shabbat Experience," monthly services and dinner. At the annual meeting Jan.
tion of the house of worship. Group series will begin on Jan.
you can have the answer." We invite you to explore the alternative at no cost or obligation. at 875-8287 or write to: Tampa Jewish Community High School, 501 S.
fits this year but we need all your help to do so. understand the importance of this deadline and abide by it. Let's make this candy sale our major fundraiser once again. With a little effort from everyone this can be a huge success. Remember everything you order benefits our JCC Preschool! Please turn in all monies to the JCC office. "We're martin' it jugl for .you..."
IMPORTANT: Whan your Drive is completed, enter total number ot pieces sold and monies collected lor the entire drive. special events to the Community.